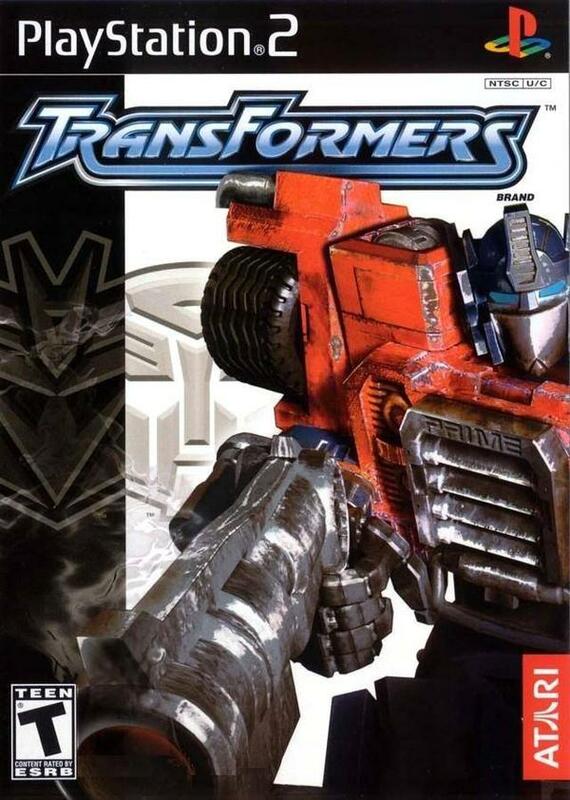 Transformers was a game that I was far too excited about when it was released way back in 2004. It looked like a fun 3rd person action game and it had all the best Transformers in it to boot. So then it came out and I just had to have it. Especially with the Transformers comics I was starting to pick up, it was a game that maybe I was building up too much. But then, time passed. The game went out of print, and years went by. But thanks to the wonders of eBay, I've been able to relive those days, and play through the game that was Transformers. The openeing of the game greets you with a quick tutorial through the two analog stick and R1 firing control scheme. Once you've got the hang of that, you immediately start shooting Decepticlones(great name) and meet your first Mini-con(not so great). The basic gameplay is easy enought to wrap your head around. Move with the left stick, aim with the right, and shoot dudes. You can also transform into the car form at any time, but there are very few instances where it's required, and even fewer where it's wanted. There isn't much in the way of using cover so your best bet is to get used to the idea of circle strafing. The problem with that become apparent when the enemies are still able to hit you most of the time. And there are a lot of enemies around you at almost all times. So it makes for a very hectic pace. But, as I found, almost too hectic. Especially towards the end of the game when it's easier to just run past everyone instead of staying to fight. To help with the battles though, you have four slots to attach mini-cons and power up you selected Autobot. One attaches to the standard attack, one to the jump, one for a defensive secondary, and one for an offensive secondary. It can all become pretty complicated since each one has it's own power rating and you have a limit to how high that can go. Also, different combinations lead to better enchancements. For instance, I had two yellow mini-cons on my jump and defense, and had basically a second life bar. It's a nice way to add some depth to an otherwise straight forward game. There are only a handful of individual levels, and took me something like 3-4 hours to get through. The levels themselves are fairly impressive in size. And the graphics are decent, especially when it comes to named Transformers. There is a lot of space to wander around and find all the hidden elements, but if you're just trying to get through the level, it's very clear where you should be heading. The scale of the level can be impressive for a PS2 game. While it is mostly linear, the option to explore is always there, and eventually, necessary. After you finish the main campaign and dispacth of Megatron, you need to battle Unicron. But to face him, you need to go back and collect a set number of Mini-cons to be powerful enough. While it is fun to go back and see what other powerups you've missed, it just screams of artificially lengthening the game when they realized how quickly it could be finished. That being said, it didn't take long to find enough of them to get to the final battle. It is worth noting that even though they look a lot like the G1 Transformers, the game is based on the more recent Armada series. But it's easy to overlook since there's nothing too overt about it. There are some really cool moments in there for Transformers fans and it's neat to go through a competent game with the license. The fight with Tidal Wave alone is enough to get me excited, and man, I remember seeing the trailer for that and being blown away. Transformers is a tough game to go back to. The 3rd person action/shooting genre has evolved so much in the past 6 years, that it doesn't hold up as well as it probably did when it came out. Even so, I did have fun with it and if you're a big fan of the license, it might be worth a look. But be ready for a game that maybe doesn't control as well as you want, and can be punishingly hard.